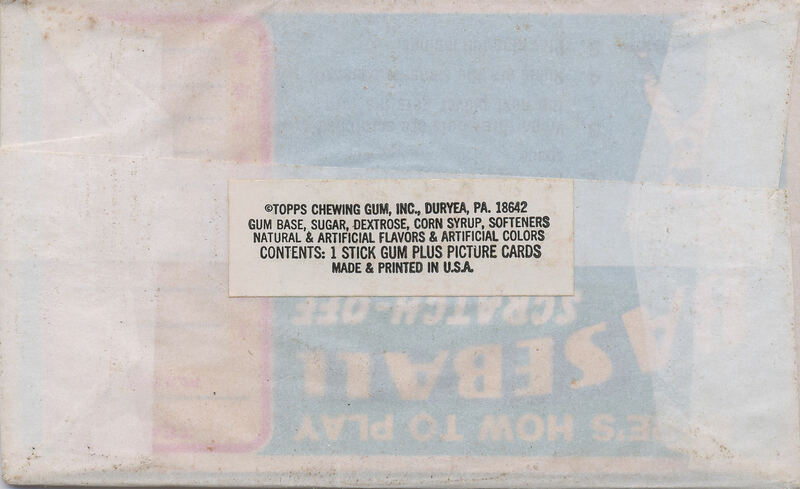 While Topps moved their gum production and card cutting, wrapper wrapping and pretty much everything that wasn't nailed down from Brooklyn to Duryea, PA in early 1966, it took three more years for their packaging to reflect the fact. 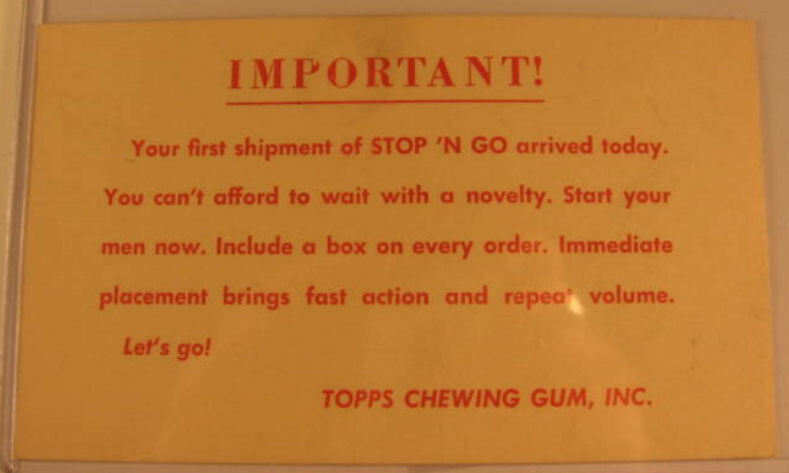 If you took a peek at the bottom of a box or a wrapper flap from 1966-68, it would show Topps as a Brooklyn company. That changed in 1969, for reasons that are not clear to me but which probably had something to do with a tax advantage. Topps still maintained their executive offices in Brooklyn after the move, where Sy Berger and Woody Gelman worked along with dozens of other people but that was pretty much it. So when did the change happen? 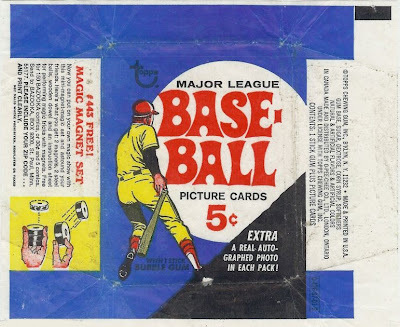 Well, right in the middle of the baseball card run it seems, although like everything else associated with Topps, it's complicated. You can see that Brooklyn (or, rather B'KLYN) is shown for the Topps address. That says Duryea folks! As a bonus, I never realized there were instructions on how to rub the rub offs before researching this post. 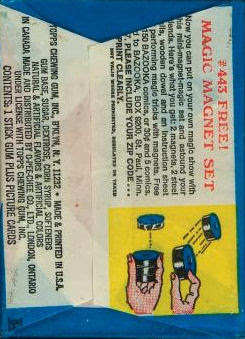 The change in wrapper graphics to show the instructions may have prompted the switch to Duryea (the fronts would just have been overprinted with the triangle splash on the earlier wrappers). The problem with this cello pack is that it was sold at least from the first through the fifth series. I can only find Duryea versions but can't confirm a Brooklyn cello is not out there. 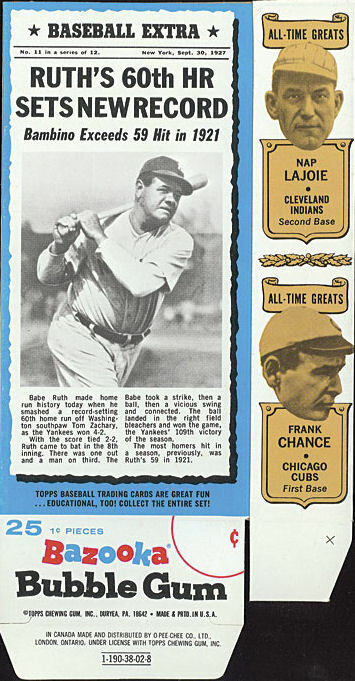 As Topps liked to issue a new series every six weeks or so back then, the fifth series would have hit the streets around July and been printedat most a month or so earlier. 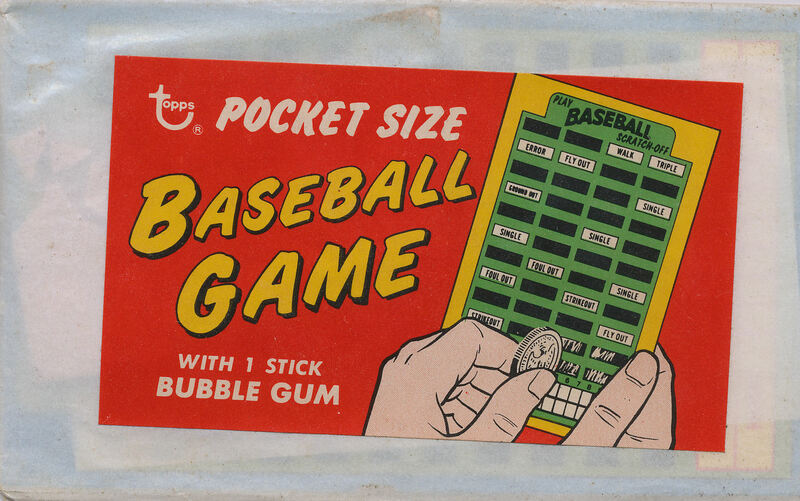 But almost every other '69 wrapper I can find shows Duryea, whether it be the Baseball Posters, Man on the Moon or Football. 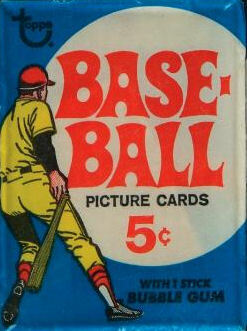 I'll have to keep looking but Topps issued a lot of sets in 1969! 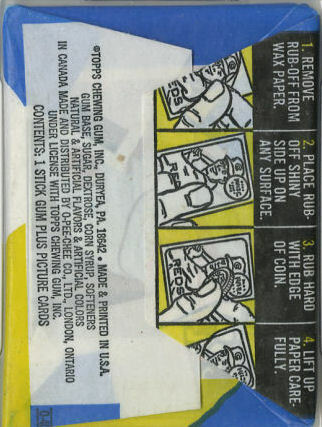 For the record, the '69 Bazooka box shows Duryea. 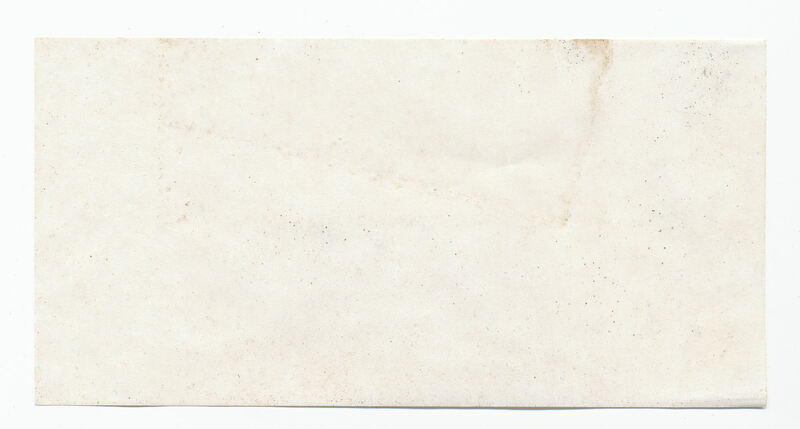 Any Archivists out there who want to help out, send scans to the e-mail address at the top of the frame. Just beware, some sets identified in the guides as 1969 issues are really from 1968 (like Planet of the Apes). 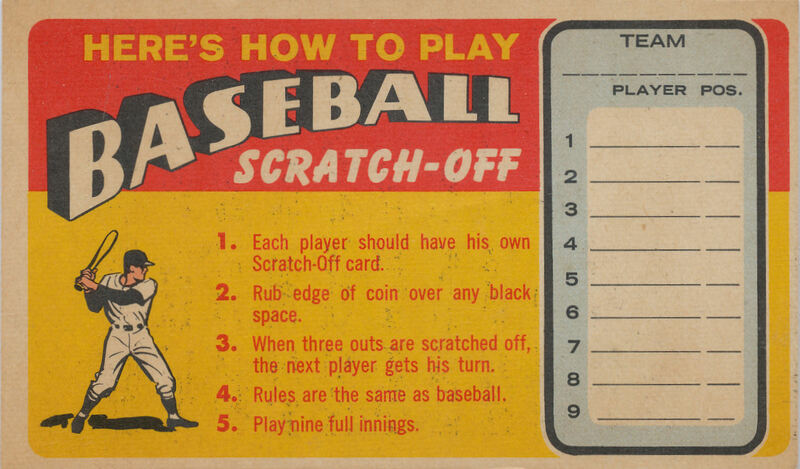 Incidentally, 1966 also marks the beginning of Topps production codes, sometime in the late summer or early fall, which are quite useful for dating certain issues but would require me to use a slide rule to explain and which will be addressed another day. 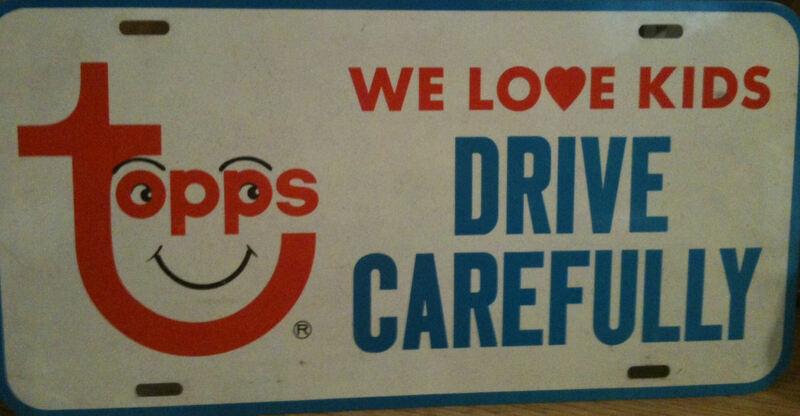 If that's not enough, the curved Topps logo also debuted once the move to Duryea was made in '66. So why didn't Duryea replace Brooklyn at that time on the packaging? Of all the major sports, when comparing Topps issues and innovation in the 50's, 60's and 70's, baseball and hockey have the most interesting and varied sets and inserts. Considering that until 1966, none of the hockey sets (with the possible exception of the 1954 issue) were issued in the lower 48 and the population of Canada is about 10 percent of the U.S., it's even more impressive. 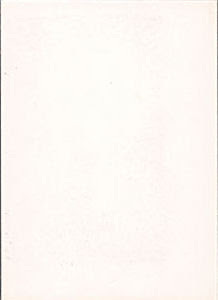 One of the more elusive hockey inserts of the era are the 1962-63 Hockey Bucks. Distributed as an insert with the 1962-63 Hockey cards, there are 24 subjects in a set known for miscuts, folds, staining and general all around non-mintness. 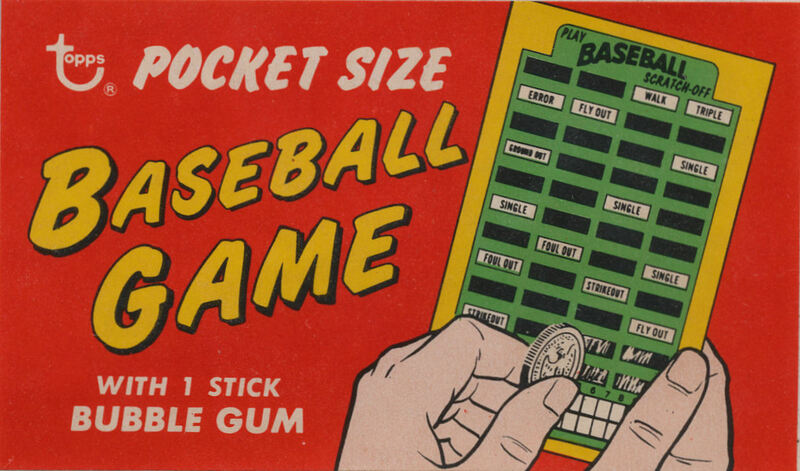 The US Baseball and Football sets from 1962 also had similar inserts and for all their problems, they are quite attractive collectibles. I picked one of these up of the 'bay and after a long wait due to a Canadian postal service strike, it finally showed up here at the main Topps Archives Research Complex. Incredibly, it held a small surprise. The wrappers for the set clearly indicate the cards were Canadian in manufacture, so this was a surprise. Still, the bucks were clearly marked as U.S. product so it was all on the up and up-I guess it was just cheaper to make these in the States. 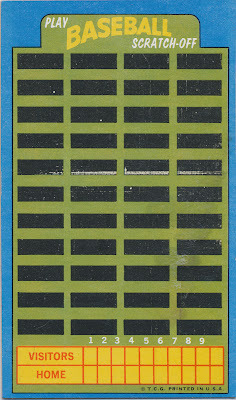 One of the more terrifically tough Topps test issues is 1966's Flipper. 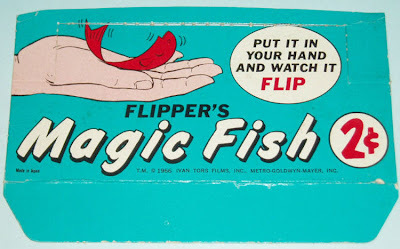 Produced in black & white, Flipper was an extremely limited test or in house "pitch" issue that never saw a retail shelf. 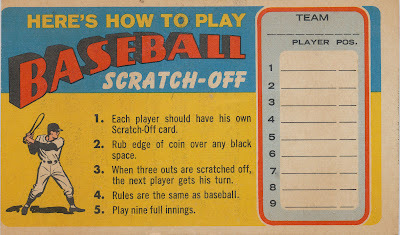 While the TV show it was taken from ran from 1964-67 the cards are easy to date at 1966, thanks to a copyright line on the back. I took a quick look at the set here in connection with a bunch of similar sets of the same era and don't really plan to address it today except in reference to another issue. 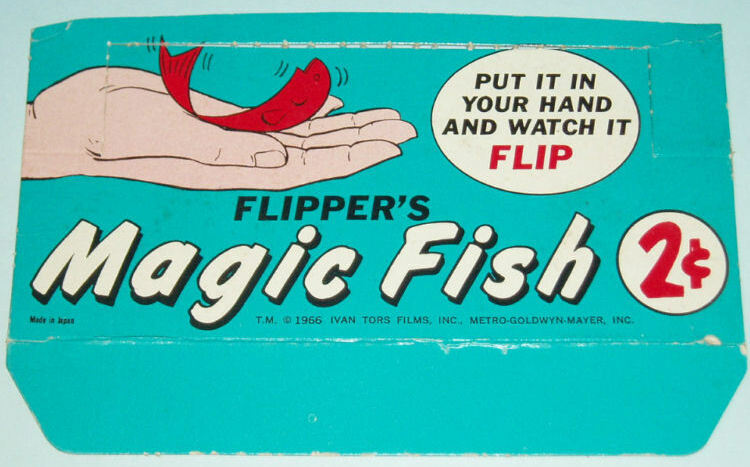 Another Flipper issue exists, called Flipper's Magic Fish and it is a real oddity. The box carries the same copyright line (1966 Ivan Tors Films, Inc.) Tors was a Hungarian director who was a bit ahead of his time and responsible for movies and TV shows alike; Daktari being one of his more well know productions. 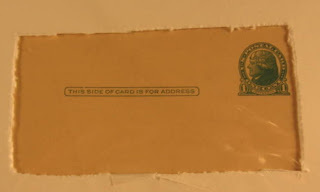 MGM also gets a credit but the 1966 Tors ID is the thing that dates the issue. 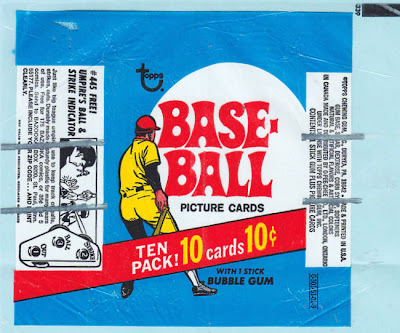 The box does not mention Topps for some reason but the strangest thing of all is the two cent price tag. I can't recall any other Topps sets at that price point. Oh, the twists and turns this blog takes! Today we enter the world of fashion and supermodels for no good reason at all, excepting a post I have been working on is not yet ready and I am about to debark on a short journey with Mrs Archives and don't want to leave without a quick look at something esoteric. Is that the full set? 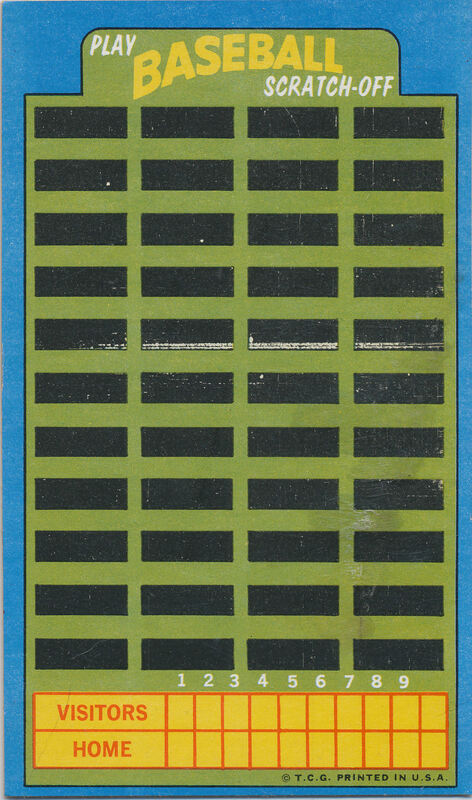 I think it possible as Topps would often proof only the basic rows that would appear on the final production sheet without regard for any that might reoccur above or below. There are no partial cards along the borders so this very well may be the array. 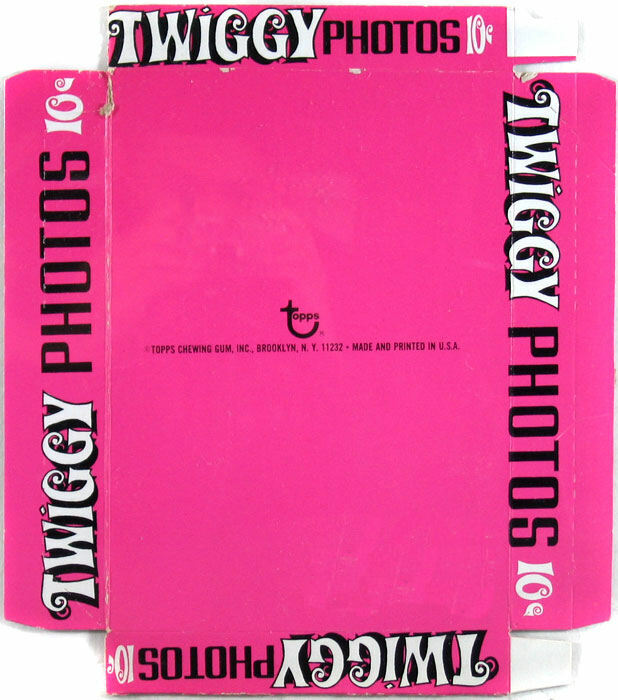 The most obvious thing, other than the hot pink color, is that the box has a ten cent price point while the wrapper shown above only sold for a nickel. 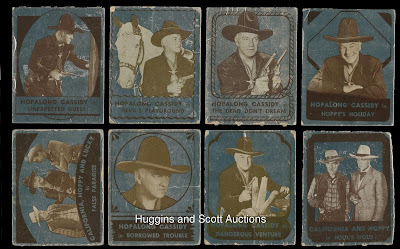 It would seem likely then that the ten cent test failed and the cards were repackaged at a lower price. That test either failed as well or the cards never hit the streets; a distinct possibility as most if not all known extant cards are from either Topps internal files or were sold by employees of the firm at a later date. The box also helps with dating in two ways. 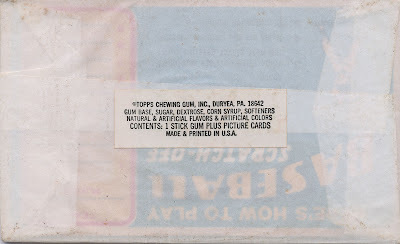 The Topps logo shown on what would be the box bottom is the newer style that debuted with the move of gum production and product packaging to Duryea, PA in the late winter and early spring of 1966. The other clue is the lack of a production code, an internal reference added beginning in 1967 to each new product. 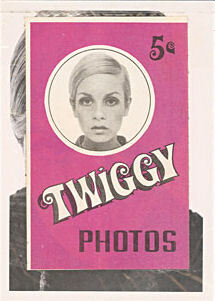 Since Twiggy really got hot in 1966 and there is no production code shown on the packaging, I estimate 1966 as the date of the set. 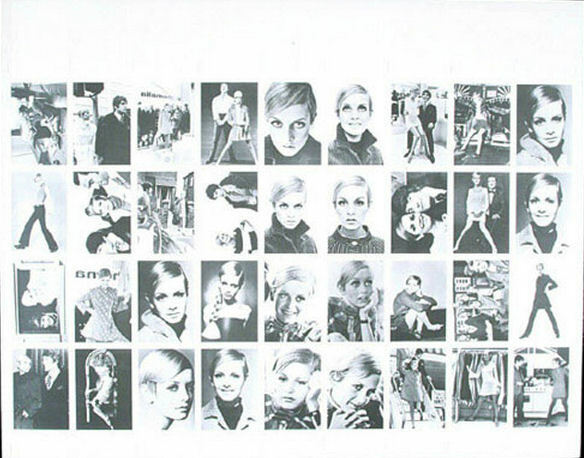 The Twiggy phenomenon was brief and bright, although she stopped modeling in 1970 of her own accord. 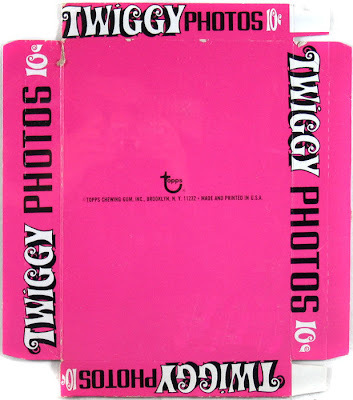 You can see some other materials and merchandise here to get an idea of how big a deal she was in the go-go 60's. 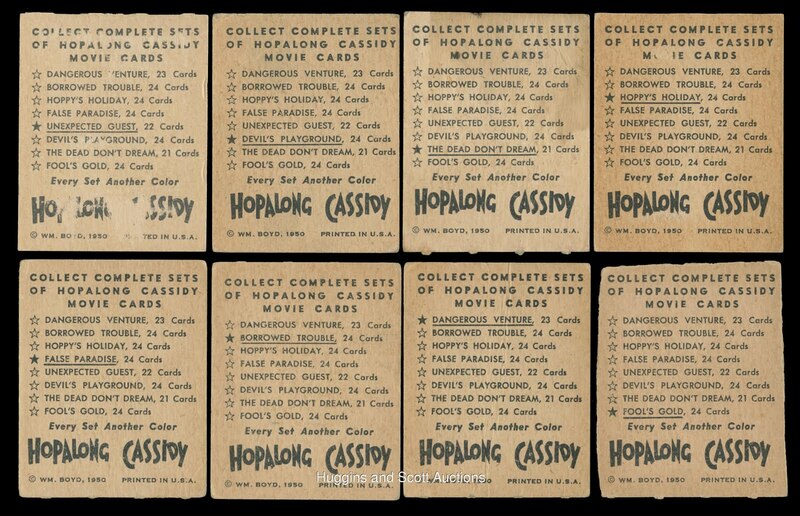 One of the things that constantly amazes me is how organized the Topps sales department was in the 1940's.  I have seen letters involving orders of only a few dollars and records detailing down to pennies the status of accounts Topps maintained for jobbers and employees alike. 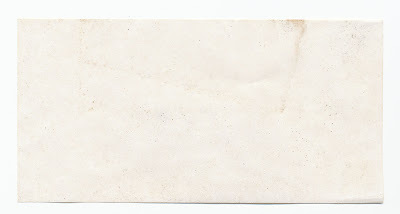 A simple penny postcard was a vital tool in the early days. By 1952 the rate had gone to two cents, so I wonder if Topps changed methods or just went along with the bump. The sticker conceals some glue that was still holding the pack together quite well even at this late date. Here's a hint: use a business card to gently separate glued packs when opening them. Slide it between the layers and slowly work through the glue, stopping if you encounter any real resistance. If it doesn't open easily just attack from a different angle or spot in the same gentle manner and the flaps will eventually work apart from the main body of the wrapper without tearing anything. I tossed the gum, which was staining the pack but kept the little insert that kept it away from the cards. 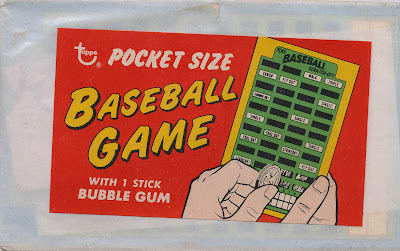 I actually measured it out to 4 3/4" x 2 1/2" although the gum was smaller and looked to be about the same size as the gum I remember as a kid. 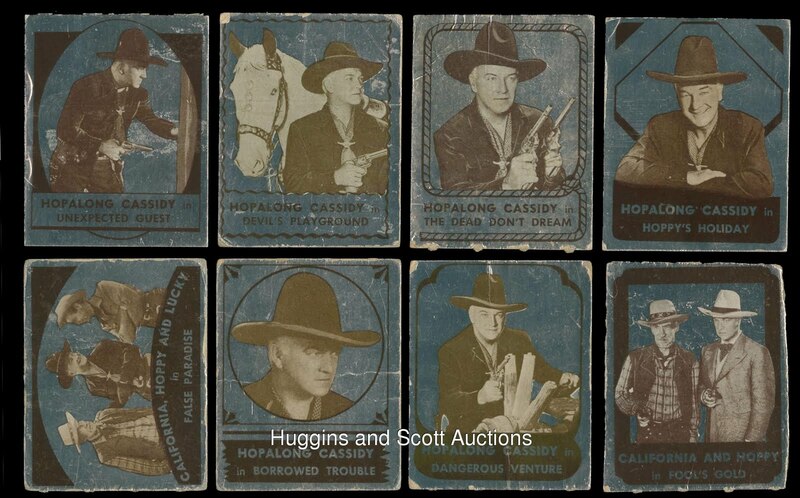 So the set has been added to the master Topps checklist I keep; now if only the date and full array of color schemes could be confirmed, we'd be all set! Still, I think this to be a pretty neat item. 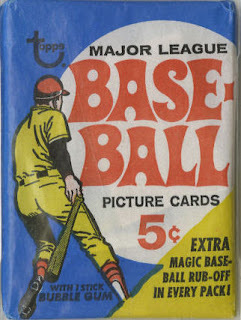 The foil cards may have been produced from a new material manufactured by Milprint, Milwaukee Printing, a key partner of Topps in the early days. They are quite susceptible to damage and prized today. 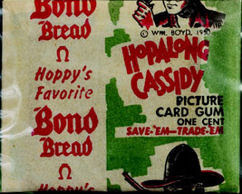 The backs show the original eight "episodes" of Hoppy issued by Topps (two additional ones would be added at the end of the run without the foil headers). 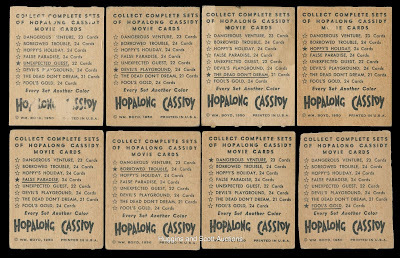 The inclusion of all eight episodes at once seems to indicate Hoppy was issued in one big series but I suspect there were two runs, slightly separated and including the second series on the checklist would have been a great way to sell more cards. 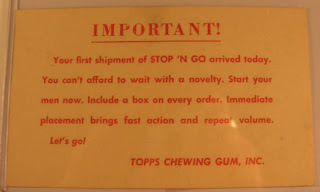 Topps was always looking for ways to move more product and get their merchandise in the hands of the public. Very early on they had third party tie-ins with Magic Photos and Varsity, so a cross promotion for Hopalong Cassidy, covered here of late was a no-brainer. 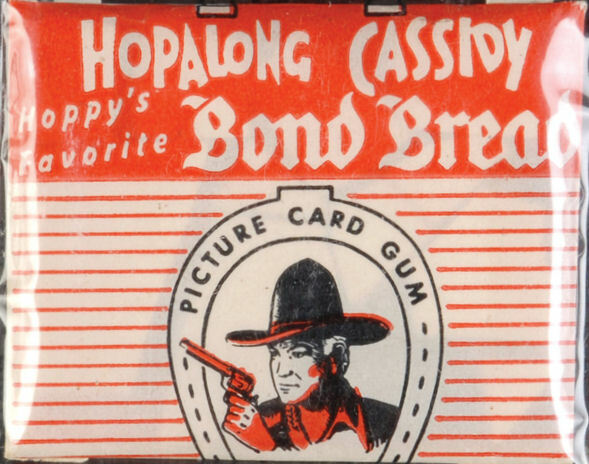 If you lived in an area where Bond Bread was sold in 1950 (and it was an area that stretched from New Orleans to New England) you could get a Hoppy card and some gum with a loaf of bread. 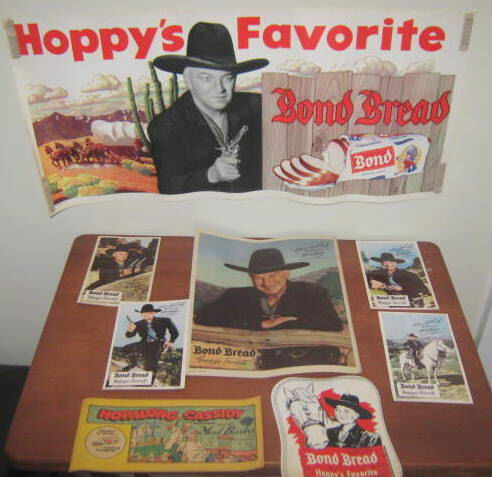 We'll take one last look at Topps and Hoppy next time out. Happy Fourth of July kids!